Let’s imagine that earlier this year I deposited some of my hard-earned money at a local bank. It sliced off a little here, trimmed a little bit there, and, when I decided to take my money out, gave me back less than I had put in. Sounds ridiculous, right? Banks pay us for the privilege of having our money on their books, right? Under normal circumstances, yes. But monetary policy-makers have plunged down a very strange rabbit hole, and this lender-pays-the-borrower scenario is now playing out across Europe and Asia. It is one of the more audacious economic-policy experiments conducted since the Great Recession. And it might be going terribly, horribly wrong. Janet Yellen Is Trying to Slow Down the Economy. But Why? The experiment is with what bankers and economists call negative interest rates — an experimental way to encourage banks to lend, thus boosting growth and inflation in sagging economies. For some time, economists were not really even sure such rates could materialize, certainly not on the scope and scale that we are seeing. Why on earth would someone buy a bond that was a certified money-loser? Why on earth would someone give their money to a bank only to see it whittled down, rather than stuffing the money under their mattress? Yet, the negative rates are here, and spreading. In a shocking move at the end of January, the Bank of Japan introduced a negative interest rate on certain deposits. Numbers in the red have also shown up in Denmark, Germany, Austria, Sweden, Switzerland, and the Netherlands, as well as in a variety of corporate bonds. And on Thursday, the European Central Bank is expected to push its deposit rates further down into negative territory in order to spur lending, head off deflation, and boost the economy. To wonks, these negative rates seem like a strange if logical extension of the rate-slashing bender the developed world has gone on since the global recession. 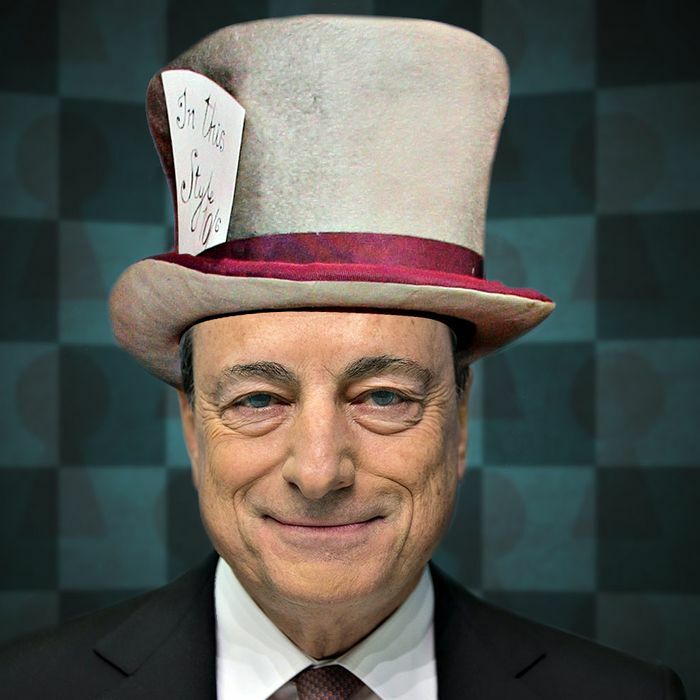 Central banks first cut interest rates down to nothing. Then, when they could not bring short-term rates down any further, they engaged in quantitative easing to pull down longer-term interest rates. For borrowers who could access it, money was really, really, really cheap. So cheap it was essentially free. And once something is free, you can’t reduce the price further, can you? Well, you can, with a little imagination: Central bankers started charging the financial institutions that are their clients to keep cash with them. Bonds started trading on the open market with negative yields. In some cases, governments made investors pay them for the privilege of buying new debt, guaranteeing those investors a loss if they held such bonds to maturity. All of a sudden, huge parts of the financial markets found themselves in interest-rate Wonderland. In Europe, the value of negative-yielding bonds has surged from close to nothing to $2 trillion in the past year, according to JP Morgan. In Japan, $5.3 trillion worth of government debt now carries a negative yield. The idea was to make holding money with the central bank or keeping it in certain forms of low-risk debt such a crummy deal that retail banks and investors would have absolutely no choice but to put that money to work elsewhere or lend it out, boosting growth and spurring inflation. On top of that, bankers figured that negative rates would lower the value of their currencies and help to juice exports. Go negative and see your economy get positive, in other words. But that does not seem to have happened, at least not yet. Europe’s negative rates have not resulted in markedly stronger growth, or increased bank lending, or a surge in optimism. What is worse, the Continent is still suffering from the specter of deflation. Over in Asia, Japan’s market has suffered and its economy has continued to under-perform, too. What gives? For one, it appears that banks are eating the cost of the negative interest rates on deposits, rather than passing them on to consumers. (In other words, our opening hypothetical has not happened, unless you replace the “I” with “a German landesbank.”) Thus, negative-rate policy has thinned financial institutions’ margins, ironically making them less likely to lend and potentially destabilizing them. In Japan, for instance, Bloomberg reports that loan growth slowed and deposits increased in the first month after the program — precisely the opposite of what the Bank of Japan had hoped. Zero or negative interest rates may produce adverse effects on the profitability of commercial banks and financial intermediaries more broadly. In a financial crisis this can result in a credit contraction. The reason is well known. Commercial banks may have to keep retail deposit rates unchanged to preserve their deposit base in a context of increased retail funding competition and substitution by banknotes. But, with lending rates reduced, this hurts banks’ profitability, especially in countries where variable rates predominate … All in all, the impact of zero rates on the profitability of banks remains uncertain and highly dependent, among other determinants, on parallel regulatory response. Second, it appears that the foreign-exchange benefit of negative-interest-rate policies has been more muted than some policy-makers might have hoped. It’s hard to devalue your currency when everybody else is trying to devalue theirs, after all. “Underlying some of the turbulence of the past few months was a growing perception in financial markets that central banks might be running out of effective policy options,” the Bank of International Settlements warned this month. Central bankers in Japan and Europe might not be able to save the world, in other words, and might be risking too much to try to do so. Investors might be more worried about these economies when they try negative-interest-rate policies and more inclined to seek safety, no matter how bad the returns. But thankfully monetary policy is not the only tool that governments have to help boost their economies. There are structural changes they can make to encourage new business formation, get people working, increase competition, and improve market functioning. There’s also fiscal policy. The E.C.B. would be under far less pressure to venture deep, deep into the land of the weird if Germany finally decided to stop running a surplus and to start financing giant infrastructure programs. Here, of course, policy-makers are working to normalize monetary policy, rather than the opposite. The Fed has started unwinding its extraordinary measures and raising interest rates. But there’s still a lesson for us in all of this. If a downturn were to hit, it might be a lot less risky and a lot more effective for Congress to take the lead in fighting it than for the central bank to do so. Given the early results of negative-interest-rate policy in Europe and Japan, this particular rabbit hole might not be worth it.